The Infiniti G35 feels and drives like a true sportscar, rather than a luxury coupe. Thanks to the long wheelbase shared with the G35 Sedan, the G35 Sport Coupe feels stable at high speeds and around fast sweepers. On winding roads, the G35 rewards the driver with quick, precise steering that offers good feedback. Drive it harder and the G35 responds beautifully and precisely, and never surprises with errant behavior. A skilled driver will find that the chassis can be rotated or steered with the throttle. The ride is on the firm side, but composed enough to not feel uncomfortable. A less restrictive exhaust, among other changes, allow the G35 coupe to squeeze 20 more horsepower and 10 more pounds-feet of torque from the engine than the sedan. The V6 produces a unique and sporty sound. There's lots of low-rpm torque, more than what's available from the more expensive German competition. This makes the G35 feel very responsive around town. Stand on the gas and it delivers brilliant acceleration performance. 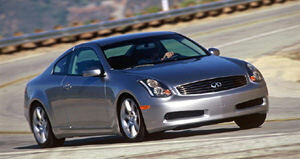 The Infiniti G35 Spoort Coupe can accelerate from 0 to 60 mph in 5.8 seconds. Shifting the manual gearbox is direct and precise though it requires a little deliberation. Match the revs perfectly and you can shift without depressing the clutch pedal. The clutch pedal is relatively firm though, and takes more effort to depress than the pedal in most luxury coupes. The five-speed automatic transmission in both cars is super-smooth in normal use and quite responsive when pressed. It offers a manual mode, which can be activated by pushing the shift lever to the right, then back to downshift or forward to upshift. Some drivers find pushing the lever to the outside awkward, but I didn't feel it was an issue. If you select third gear, for example, the transmission will still automatically shift down to second when needed, but will not shift up past third; it will hit the rev limiter instead. This manual mode reduces the tendency for the transmission to uphshift unnecessarily on winding, mountainous roads. It won't shift up when you lift off the gas to brake for the next corner, providing some engine braking and making your mountain assault more enjoyable. 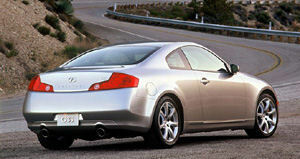 The Infiniti G35 Sport Coupe is a terrific sportscar. It is more luxurious, roomier, and more practical than the Nissan 350Z it shares its platform with, and offers the big advantage of back seats. On the other hand, it provides more nimble handling and sportier looks than the G35 Sedan, albeit at the price of a smaller backseat and reduced trunk. If you can do without the latter, the Infiniti G35 Sport Coupe is an excellent choice that can well keep up with any sporty coupe in the market.